As long as I had been baking cookies, I had never found “the” perfect recipe for rolled cookies that were both delicious and easy to make until I discovered Valerie Peterson and Janice Fryer’s amazing cookbook Cookie Craft. As simple and yummy as the finished product is, their instructions for making cookies that hold their shape during baking result in the perfect canvas needed for a beautifully decorated cookie. Whisk together flour and salt; set aside. Cream butter and sugar. Add egg and vanilla and mix well. Add in flour and salt. Divide dough and roll out on cookie sheet between 2 sheets of waxed paper. (about ¼ inch thick) Place cookie sheet in refrigerator for 2-3 hours or overnight. 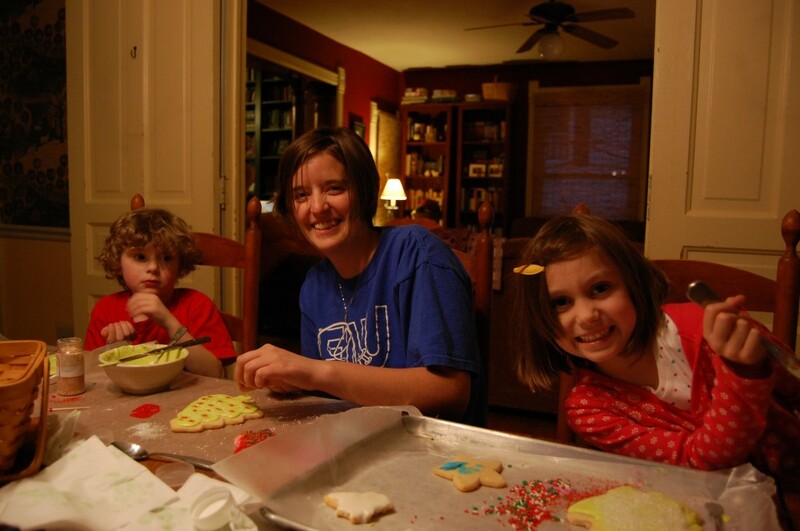 Cut out shapes and place on another cookie sheet lined with a piece of parchment paper. Bake at 350 degrees for 13-14 minutes, depending on size of cookie cutters and your oven. Be sure to take out before they are browned. Cool on cookie sheet for a few minutes and finish cooling on rack. Decorate as desired. Can be frozen and decorated later. You will not be disappointed in the results! 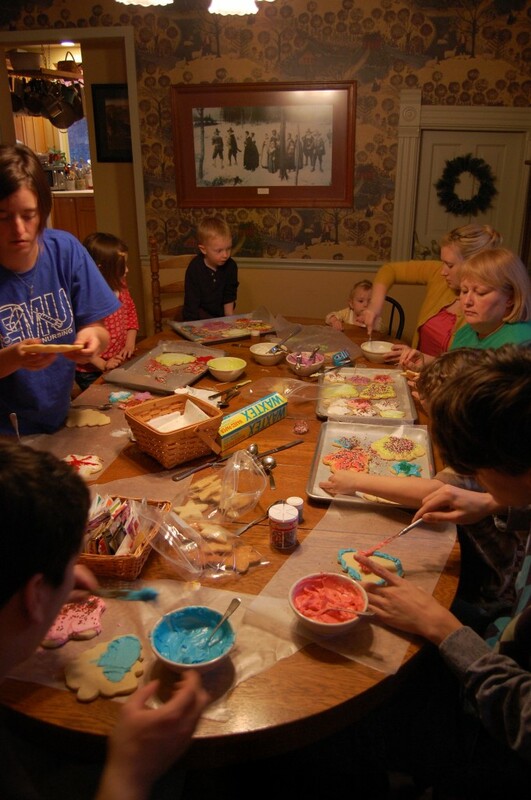 Our grandchildren loved spending an afternoon with icing “paint” and sprinkles last Christmas and I used the large cookie cutters because it was easier for their small hands to hold. This recipe makes about 4-5 dozen smaller cookies or 2 dozen large ones. Be sure to check out Cookie Craft and their newest book Cookie Craft Christmas. Both are chalk full of great tips for creating beautiful cookies and the pictures alone will make you want to bake today! I’m in the middle of making what looks like a delicious recipe (actually, my son is following the recipe). We have all the ingredients in and it is not a dough. It looks like a dry mix. Are we missing something? Lorene, that is the correct recipe. I always make sure that the butter is at room temp or softened in the microwave before I cream it. That is the only thing I can think of….let me know what happened! Just thought I would update on the baking frenzy here. 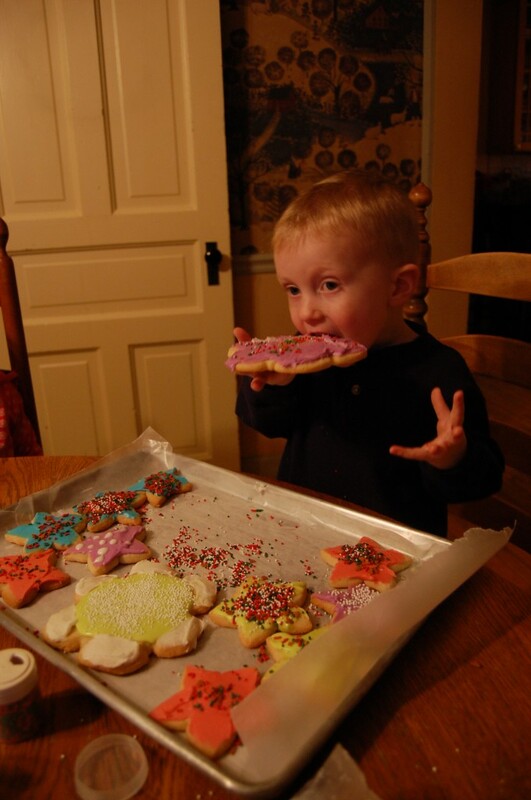 Joe and I tried piping and flooding Royal Icing on the cookies today. They are gorgeous in spite of some of our mistakes. We plan to try this again another day and I will post pictures of our results. I want to be Martha when it comes to cookies, really I do! Thank you Karen, I have a feeling my son might not have measured carefully. Hopefully, he learned a bit of a lesson! Amazing pictures! So glad you liked Cookie Craft! Happy Holidays! Valerie, thanks so much for stopping by! I hadn’t realized you had a second book out until I was linking here to Cookie Craft. My copy should arrive today or tomorrow, ready to inspire and instruct me on my next batch. I had never had success with piping and flooding until reading your careful instructions. Your Royal Icing recipes were perfect! I am finding that the secret to it all, besides following your instructions to the “T” is in getting perfect piping so am sure practice will make perfect. 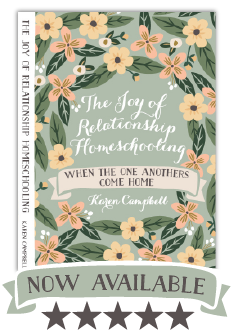 I am adding your books to the “curriculum” list I am assembling for future homemakers! Lorene, I chuckled as I read your comment. My boys were the ones who were cutting and decorating and some of the results are too funny. Joe is meticulous about everything (sometimes drives me nuts with this perfection stuff) and cut out these perfect penguins. Then he proceeded to take about 2 hours to pipe and flood them with some pretty good results for the first time doing so. Will on the other hand thinks that the more frosting you use the better the cookie and his penguins looked like the bride of Frankenstein. Same mom, same teacher…go figure!